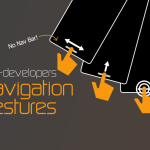 Gesture navigation has become a staple feature on most flagship smartphones these days, with much debate centered around who does it the best. Android P brings native gesture control to all supported devices like the Google Pixel and Google Pixel 2, Xiaomi offers full-screen gestures on the Xiaomi Redmi Note 5 Pro and devices running MIUI 10, Motorola’s Moto Z3 Play has an Apple iPhone X-style pill bar, and lastly, there’s OnePlus with their take on navigation gestures on the OnePlus 5T and OnePlus 6. If you want to ditch the software navigation bar and use gesture navigation, we at XDA came up with an app that helps you do just that. Our first release of the app brought iPhone X-style navigation which we later expanded on with more customization and actions. Now, the latest release brings a feature many of you have been asking for: OnePlus-style gestures. 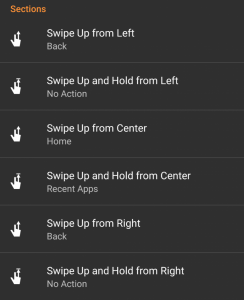 The latest update to the XDA Navigation Gestures app brings OnePlus 6-style gestures without root to any Android device like the Google Pixel 2, Samsung Galaxy S9, LG G7 ThinQ, and more! Best of all, it’s free! (Well, the standard navigation actions like back, home, recent apps, etc. are free!) Check out the video below for a demonstration of the feature. After updating, we recommend rebooting if you experience any issues. If you have any issues with the premium app not being detected, please download version 10.7.19 of the Google Play Store as recommended here. If you still have issue after that, then please reach out to us. Thank you to all of the users who purchased the premium version to support us. Continued development of this application would not be possible without your support. After this release, our primary focus will now be on adding new premium features! The update is rolling out to users on the Play Store now. If you would rather not wait for the update to arrive, you can download the APK here. The changelog is massive, so I’m going to split up the changes into sections to keep things organized. Split Pill (OnePlus 5T/OnePlus 6 Style Gestures) – divides the pill into three sections, each with their own set of actions. When you enable this, we provide a set of recommended settings to be applied that mimic the OnePlus 5T/OnePlus 6 gestures. Blacklisting – Add new “Show NavBar in Selected Apps” option. Choose which apps should always show the original navigation bar. Blacklisting – Add new “Hide Pill in Selected Apps” option. Choose which apps should never show the pill. Pill Hiding – Add new “Hide Pill After Specified Delay” option. When enabled, the pill will automatically hide after the specified delay. 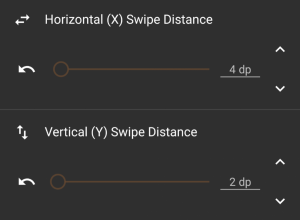 Sensitivity – Add new “Horizontal (X) Swipe Distance” slider. This is the minimum horizontal distance you have to move the pill (left or right) for one of the left or right gestures to trigger. Sensitivity – Add new “Vertical (Y) Swipe Distance” slider. This is the minimum vertical distance you have to move the pill (up or down) for one of the up or down gestures to trigger. Added a premium license check on the main screen. Some people have had issues with the app not detecting premium status, so hopefully adding this check will force it to be recognized. Fixed issue where battery percent text was cut off on the Pixel 2’s always on display. Enable Immersive Navigation Mode. 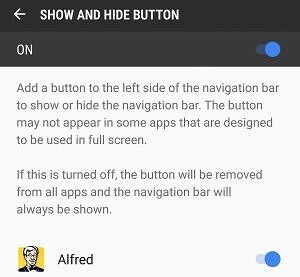 Enable Android’s Immersive Navigation Mode when Hide Navigation Bar is active. This fixes issues on Samsung devices and lets the Force Touch home button work. 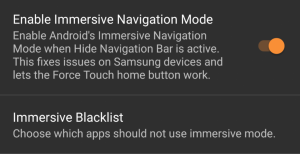 Immersive Blacklist (only available if “Enable Immersive Navigation Mode” is enabled.) Choose which apps should not use immersive mode. Detect if the app is installed on a tablet and try to enable Tablet Mode automatically. Hide Pill when Keyboard Shown. Attempt to put the pill into “hide mode” when the keyboard is shown. May not work on all devices. Keep Pill Shown in other Overlay Apps. Choose which apps the pill should be forced to stay on top. Useful for apps like Facebook Messenger chat heads, Drupe, etc. Use Full Overscan. By default, Navigation Gestures leaves 1 pixel of the original navbar visible. Enable this to remove that pixel (the “white line at the bottom.”) WARNING: This will break certain devices! **If you notice that an app is “slow” to launch after using the pill to trigger the home button, that’s because of an obscure change made all the way back in Android 4.4 KitKat. Unless you have this Xposed Module or a custom ROM installed with the patch, there’s no way around it. ***Lock Screen is compatible with the vast majority of devices. How it works is like this: Makes screen brightness and display timeout minimum and then displays a fullscreen black activity until the phone actually enters sleep mode from the timeout (~5 seconds.) There are other ways to lock the screen but we decided against them, at least for this release. Please expand the button below to see our answers to a list of frequently asked questions. Help, I uninstalled the app and I can’t access my navigation bar anymore! Help, I uninstalled the app and the original navigation bar keeps hiding itself! Can we add a feature where the pill is in its own separate area so it doesn’t overlap with certain UI elements? No, sorry. We are already pushing the screen content down to hide the nav bar. Adding this feature would require us to push the screen content up as well. We can’t have it both ways. There’s a “white line” at the bottom of the screen! This is NOT a bug. This is a side-effect of a change we intentionally made after version 1.0.0 because without it, many Samsung, Motorola, and Xiaomi devices were reporting major bugs (eg. black screen after unlocking which made the phone unusable.) The “white line” is caused by the navigation bar being hidden 99.99% but not 100% (ie. we hiding the navigation bar entirely except for 1 pixel.) So the “white line” is actually just your navigation bar that’s colored white. We added an Experimental Setting called “Use Full Overscan” which gets rid of the white line. Use it at your own risk. Pill doesn’t work with Samsung DeX/Samsung Good Lock! Android prevents third-party apps from showing overlays on top of SystemUI apps like the status bar and lock screen. 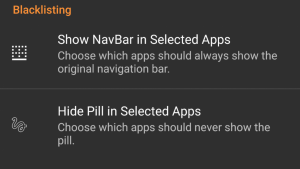 You can use the blacklist function in Behavior settings to make the original nav bar show in these apps. Pill doesn’t show when you open the camera from the lock screen, answer a call from the lock screen, or open a notification for quick reply from the lock screen! Android prevents third-party apps from showing overlays on top of SystemUI apps like the status bar and lock screen. This also includes calls, apps, or notifications answered from the lock screen. The pill cannot be shown until you unlock the device. Pill doesn’t show in Facebook Messenger, Drupe, or other floating apps! 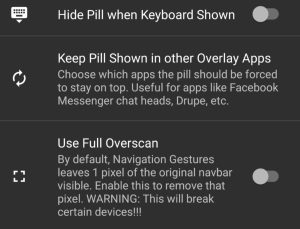 Go to Experimental Settings and select the “Keep Pill Shown in other Overlay Apps.” Pick Messenger, Drupe, etc. in this list. Pill doesn’t work with screen pinning. We have no way of simulating a long press on the back button without root. A tentative solution we are looking into is detecting when the phone enters a pinned screen state and disabling the pill to bring back the stock nav bar. Home action doesn’t work on the OnePlus 5! OxygenOS prevents the app from performing the home action if you both enable the software navigation bar and disable the “always enable home button” option in Button settings. To fix this, please enable the “always enable home button” option. Pill keeps “jumping” up and down with the navigation bar! Nova Launcher: In the “Notification Bar” section under “Look & Feel,” there may be a “Hide Navigation Bar” option. If there is, check to make sure that it is disabled. 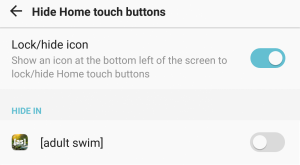 LG G6/LG V20/LG V30/LG G7 ThinQ: Go to Settings > Display > Home touch buttons > Hide Home touch buttons and disable the “lock/hide icon” option up top and uncheck every app in the list. 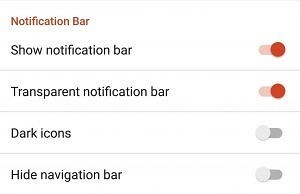 Samsung Galaxy S8/Samsung Galaxy Note 8/Samsung Galaxy S9: Go to Settings > Display > Nav Bar > Show and Hide Button and turn off the toggle up top and uncheck every app in the list. Please expand the below to see our answers to a list of feature requests. Is it possible to keep the pill in the same spot when rotating the screen? We will be adding this as a feature in a future release. Can we add an action to launch a shortcut/activity? Can we add Tasker integration? Can we add a swipe down and hold gesture? Yes, that is on our todo list. We test each release ourselves before pushing it to the Google Play Store, but we also have a beta testing group on Telegram which you can join here to get the latest features. Feedback is very important to us. While we are blessed to have access to a large team that owns a wide variety of devices from several different device manufacturers, it’s difficult for us to ensure a bug-free experience on every device. If you are having trouble with our app, don’t hesitate to email us or post in the official XDA support thread. We plan on adding additional actions in coming releases to give users more options to control their device. We hope to provide an experience that can fully replace the navigation bar on your device. If you feel that we should add a feature or two to make that happen, then please reach out to us with your ideas!